Golden Copper, Cuivre d'Anatolie, Червонец тетис. Distribution range of the species includes Greece, Asia Minor, Armenian Highlands, Iraq, Iran, Baluchistan, Chitral, and Ladak. The species is monotypic. In Armenia Golden Copper inhabits high mountains (between 2300 and 3000 m a.s.l. ), preferring dry grasslands alternated with rocky outcrops, where the host plant of this butterfly - Acantholimon sp. can grow. The flight period of the species is from mid July to mid August. The species' density within the typical habitat can be considered as uncommon to rare. The population trend of the species during 2003-2013 is rather stable (p>0.05). It appears that Golden Copper's host plant is quite resistant towards the main disturbing factors in the subalpine area - overgrazing. The species has not been assessed for the Global, European, and National Red Lists, and also is not included in Appendices of CITES and Bern Conventions. Preliminary assessment of the species' conservation status suggests it as Least Concern. A small part of its distribution range is covered by Lake Sevan National Park and by Zangezur Biosphere Complex, also the species distribution range is partly covered by Emerald Sites: Zangezur, Lake Sevan, Aragats Alpine, Arai Ler, and Dadjur. 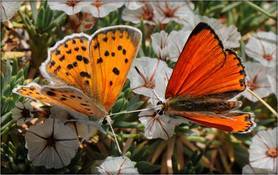 Also the Golden Copper is presented in Prime Butterfly Areas Lichk, Kajaran, and Artanish-Shorzha. Obviously, there is no need to develop conservation measures for protection of the species, however it is still important to protect its habitat via: (1) designation of new Prime Butterfly Areas, which later can be transformed into Emerald Sites, and (2) development of management plans for already assessed Emerald Sites. Golden Copper is an important object for butterfly-watching and development of such can improve appreciation of the species and support its habitat protection by local communities.